Humble Pi | Always learning, always growing. I was talking to a colleague recently about how we plan for a new school year, and the parable of rocks in a jar came up. Reflecting on this parable, I decided to select four big “rocks” – one for each quarter – that are the foundational ideas I want to cover this year. Building lessons while keeping the four big concepts in mind would help ensure that they wouldn’t get lost in the day-to-day gravel and sand of the school year. This year I will be teaching Math 8 and Integrated Math 1. So, with the California Common Core State Standards for Mathematics in hand, I picked my four rocks. What do you think? Do you agree with my “rocks”? Earlier this school year, I upgraded my two-year old Pantech Breakout to a fancy new Samsung Galaxy S5 (to be honest, I have a little bit of buyer’s remorse over that. It seems like an awfully fancy phone for a teacher who’s a single mom). The new phone supports more apps and has more memory than my old phone. I went a little crazy signing up for Pinterest (I don’t grock it), Instagram (much more fun than Facebook), and Twitter. My Twitter subscriptions include several teachers, education bloggers, and education websites. Today there was a tweet from Edutopia that linked to a year-old entry about notebooks as a management tool. This is an idea that I’m going to try. This makes such sense to me. In my inquiry class for my masters, I got in the habit of jotting notes about what was working and what was not, and I found that this helped trigger brainstorms of new things to try. I like the idea of using it for management problems as well. The author runs Cult of Pedagogy which I’m now following on Twitter as well. This is the fifth lesson in Jo Boaler’s “How to Learn Math (for Students)”. A great aid to intuitive thinking is visual representations through drawing. That takes the math out of the realm of formulas and algorithms and puts in into a concrete context. There are “Big Ideas” in math that the formulas and algorithms are about exploring and using. 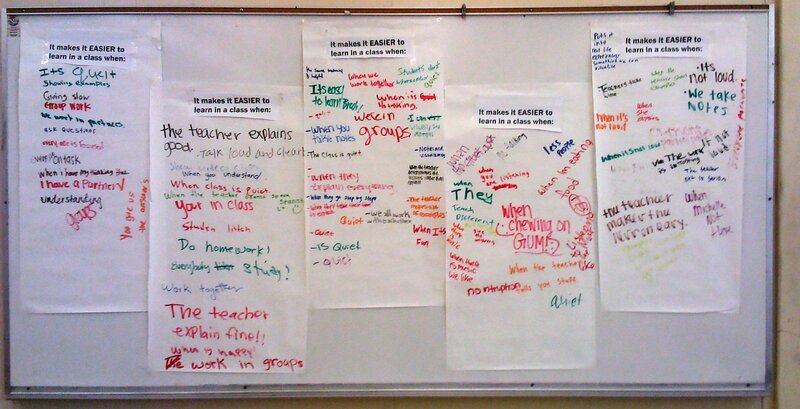 However, sometimes in math class, those big ideas get lost, and consequently, students get confused. For example, the Big Idea of Pi: In every circle and every sphere the circumference is always a little bit more than three times the diameter. If students can learn the big ideas and hold onto them, they will find math really clear and easy to use. In other words, formulas are only useful if you understand the big idea that they are illustrating, so students should always start by trying to understand the big idea. Drawing a picture helps a lot. Keeping in mind that math is about relationships between quantities helps too. So asking questions about how the quantities relate (like diameter and circumference) can help facilitate understanding of the big idea (pi is the same for all circles). This is the fourth lesson in Jo Boaler’s “How to Learn Math (for Students)”. She starts by discussing some more math myths: That math is just a lot of rules that need to be memorized, that it is all about right or wrong answers, and that it is not a creative subject. But studies show that high achievers think of numbers flexibly and low achievers believe there is only one correct way to do any problem. Multiply 20 x 5 = 100 and then subtract 2 x 5 = 10, so 100 – 10 = 90. That was four different methods – there may be more! But some students believe that it is not allowed to change numbers in this way, but this type of flexible thinking is really important. Students can get in the habit of thinking about multiple ways to solve any problem. One way to develop this habit is to work with others. Math is not an individual, solitary activity. Talking about math can greatly increase a student’s level of understanding. In fact, mathematician Uri Treisman studied UC Berkeley students who were failing calculus classes and leaving the university. He found that there was only one difference between students who were failing and those that were not: The successful students worked together on their math and talked about it, where the unsuccessful students worked alone. So Treisman put the failing students in study groups, and within a year they started out-performing the other students. 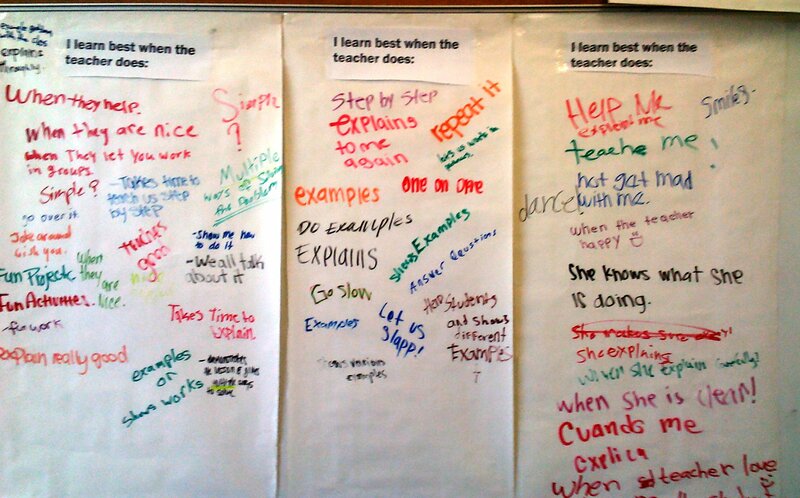 It works because discussing problems engages students in reasoning and metacognition. Lastly, it is important to remember that all math is connected. It is not just discrete topics that need to be mastered. For example, proportions come up again and again in math over a lifetime of math learning – fractions, similar triangles, dilations, graphs, slope, rates of change, the Pythagorean Theorem and Pythagorean triples. Higher achieving students see these connections to big ideas, whereas lower achieving students just try to memorize methods. The PISA study showed that students with a fixed mindset (who believed that people are either good at math or not) achieved at lower levels, and the kids with a growth mindset were the highest achieving. And students with a growth mindset who also used positive strategies (who made connections and didn’t memorize) were the highest achieving students in the world. This week, I tried the “First Day Graffiti” project. Only I did it on the second day of school. Because I’m a rebel like that. I’ve posted these in my classroom as a reminder when I plan my lessons. These students really care about their education, and they know what they need. I need to listen.